Chicago porches have been occupying front pages of local newspapers for a while now. Associated with several accidental deaths and injuries, they became one of the most sought after structures the Chicago Building Department inspectors evaluate. 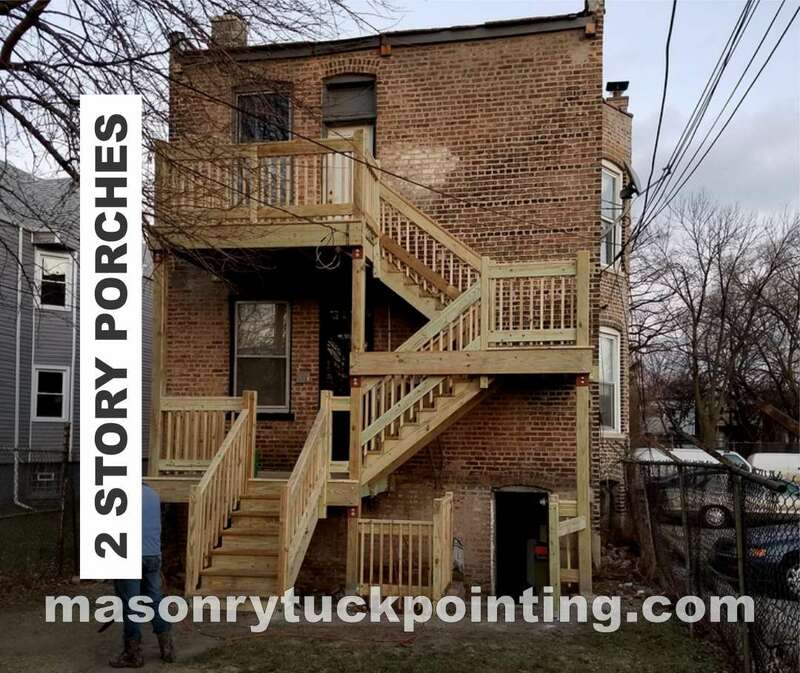 The results of those inspections vary a lot but violations that require Chicago porch architectural drawings and complete porch rebuilding are very common. Not sure if your Chicago porch requires rebuilding or repairs? Just like any other structural component of a building, porches must comply with the Chicago Building Code. No matter if these are only single story tall porches, wooden porches spreading over multiple floors, small, large, rear porches, or front porches, safety of anyone using them is equally important at any level. We don’t like to be told what to do, especially if it’s going to cost us money, but that shouldn’t matter when safety of the building occupants and their lives are at stake. That’s why building inspectors are so persistent in their “code compliant Chicago porch” crusade. 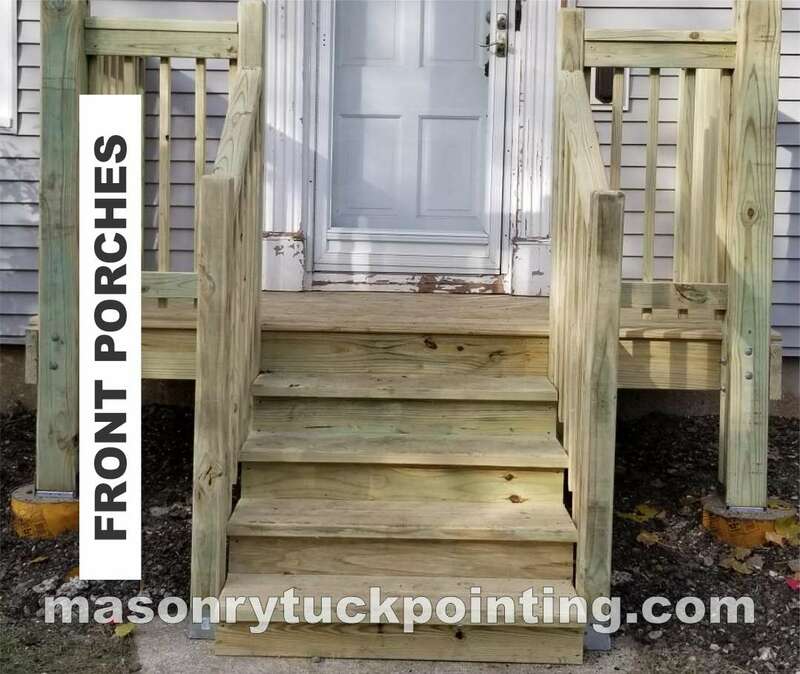 If you had your porch constructed based on a porch architectural drawings, had a Chicago building permit issued and inspection performed / porch structure approved by the City of Chicago building inspector, you should be in a good shape. However, if you have an old porch that, to your knowledge, has never been examined by a professional, you should schedule an inspection by a professional as soon as possible. The number of Chicago porch problems that can result in serious injury or even death is quite large. Even potentially small issues, sometimes difficult to spot with an inexperienced eye, can lead to life threatening situations. For detail Chicago Porch Guidelines, click the button below. This post covers only some of the Chicago Porch building code requirements, for all details you’d need to gain access to / purchase the Chicago Building Code available after clicking the button below. I usually do a lot of research before I let someone touch my home. After talking to a few tuck pointing companies it was obvious... read moreI usually do a lot of research before I let someone touch my home. After talking to a few tuck pointing companies it was obvious that Edmar Corporation was the one. I got several quotes, Edmar was honest and priced very well. Their efficiency and neatness were most impressive, thanks for a great result! Edmar Corporation Masonry was contracted for three projects on an industrial building in the City. The first project was to rebrick part of a doorway... read moreEdmar Corporation Masonry was contracted for three projects on an industrial building in the City. The first project was to rebrick part of a doorway that had been damaged by a forklift. His price was reasonable and the work was done properly. The second was tuck pointing and water sealing an exterior wall. The price was reasonable and the work was done just as I had requested. The third project was a difficult one, it required scaffolding and high up work that was quite difficult to get to. It required rebricking. Again his price was reasonable and the work was done properly. All work was completed quickly. I had other quotes for much more money and some contractors trying to upsell me for more work that they promoted as necessary. I was satisfied with Edmar and have just given this company another project. When I find a worthy contractor I stick with him/her. Edmar is worthy. I needed some tuckpointing done on a condo I manage in Chicago and called Edmar for a quote through a mutual friend that had used... read moreI needed some tuckpointing done on a condo I manage in Chicago and called Edmar for a quote through a mutual friend that had used Edmar and spoke very highly of him. EDMAR came to replace 35 feet of sidewalk by my house. They busted old concrete one day and poured new sidewalk next. NICE JOB. By far the most professional and highly skilled company I've worked with. I had a chimney taken down and rebuilt from the roof line up. ... read moreBy far the most professional and highly skilled company I've worked with. They rebuilt my parapet wall quickly for a reasonable price! The wall looks great. I'm very satisfied with their work and customer service!! We had some cracks in the masonry on our building, it wasn't a big job but Ed came by to take a look anyway. Compared... read moreWe had some cracks in the masonry on our building, it wasn't a big job but Ed came by to take a look anyway. Compared to all the other contractors that stopped by, Ed gave the most information about why we have the issue and how it would be repaired. He also gave us the estimate right away. The price was great, but we had to wait a couple weeks since it was busy season and our project was small. I used Edmar Corporation a few years ago to fix up my home in the north suburbs and was very pleased with their work. I... read moreI used Edmar Corporation a few years ago to fix up my home in the north suburbs and was very pleased with their work. I reviewed a number of companies and eventually settled on Edmar as they were clearly the most knowledgeable and the most experienced. I've found out the hard way that it's not always best to go with the cheapest proposal...had some contractors rebuild my chimney a while back only to have the mortar crack 5 years later (!!!) Edmar was not the cheapest, but you definitely get what you pay for, and when it comes to home repair, you want the job done right. We had several issues to address, including retaining walls, parging, tuckpointing and replacing old lintels. Ed came out to review and estimate, was very thorough... read moreWe had several issues to address, including retaining walls, parging, tuckpointing and replacing old lintels. Ed came out to review and estimate, was very thorough and explained everything in language I could understand. He was price competitive. The crew was very focused and did an outstanding job. Finished product looks great. If it were possible to give more than 5 stars, I would! We had to reconstruct our brick and wrought iron fence after the garbage... read moreIf it were possible to give more than 5 stars, I would! We had to reconstruct our brick and wrought iron fence after the garbage truck relocated it to the ground. It wasn't a huge project and many of the masonry companies we called wouldn't even come and give an estimate because "it wasn't worth it". We found Edmar on yelp and the experience was awesome from start to finish. These guys came thru. After some problems getting the work completed they came back out and finished the work as well as some additional brick... read moreThese guys came thru. After some problems getting the work completed they came back out and finished the work as well as some additional brick replacements. I had Edmar rebuild a portion of my parapet wall. I had gotten quite a few recommendations and estimates from different local companies. Ed and... read moreI had Edmar rebuild a portion of my parapet wall. I had gotten quite a few recommendations and estimates from different local companies. Ed and Peter with Edmar came out and gave some great improvement suggestions that other companies did not, in addition to providing a reasonable estimate on the spot. I felt comfortable and trusting in Ed and my wife and I decided to use Edmar. My husband and I bought a foreclosure on Newcastle and needed to do some work. In order to attain inside look of the kitchen we... read moreMy husband and I bought a foreclosure on Newcastle and needed to do some work. In order to attain inside look of the kitchen we wanted, we needed to brick some windows in and maybe move the door and also repair the chimney. Let’s take a look at just a few building code requirements for the Chicago porches that affect safety of their occupants. Just like your house requires foundation, the same principal applies to a porch as well. Without proper footings under walls, columns, or piers, the entire porch load would not be properly distributed. Shifting the porch’s load onto one side, because of the faulty foundation, could have catastrophic consequences. Porches come in different sizes, and their footings sizes must be proportional, positioned in such way that guarantees proper distribution of weight and minimizes possibility of uneven settlement of the entire structure. Also, your patio and sidewalks cannot be used to support structure of a porch. Freezing – thawing cycle during the cold season causes ground to expand and contract. Whatever is supported on a few inches thick concrete slab, will move up and down, sometimes by 2”-3”. Heavier porches resting on such “foundation/slab” will crack it and could tilt, slide off / separate from the building structure, and even collapse. Chicago climate forces us to dig deeper holes for footings in order to alleviate problems associated with that freezing – thawing cycle, and to ensure that they can support up to 3 story tall Chicago porch structures. All Chicago porch footings must extend at least 42” (3 feet and six inches) below the surrounding ground surface. 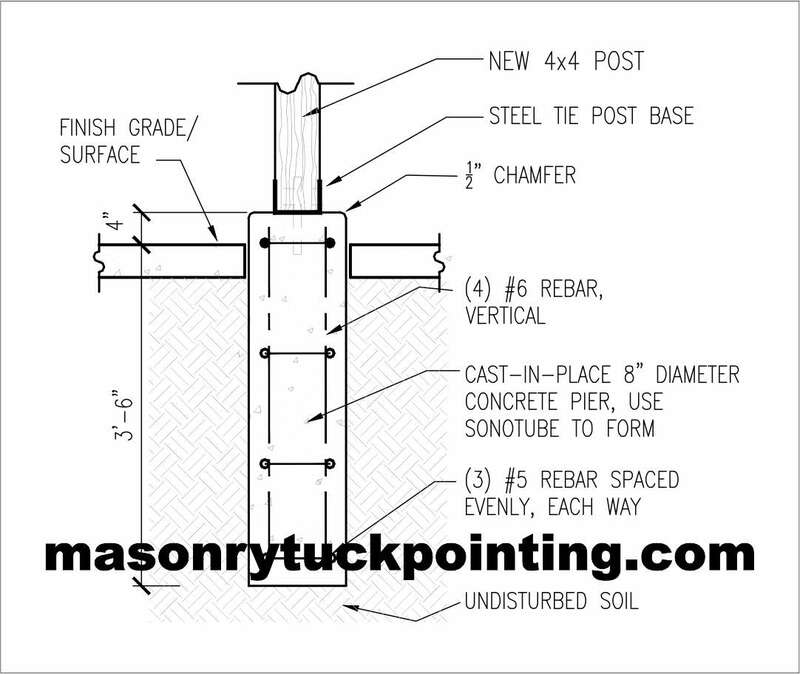 There is an exception from this requirement (https://www.chicago.gov/content/dam/city/depts/bldgs/general/EZPERMIT/PorchGuidelinesMay2011.pdf – CHAPTER 13-132 FOUNDATIONS 18(13-132-100) FOOTINGS – DEPTH REQUIREMENTS) that applies to single story buildings only. or plain (without reinforcement) concrete (details in CHAPTER 13-132 FOUNDATIONS 18(13-132-110) FOOTINGS – CONSTRUCTION). To clear the confusion, we have two definitions for the type of wood (Pressure Treated Lumber / Wolmanized) normally used when building Chicago porches. Also known as “treated lumber” or “Wolmanized Lumber”. The wood treatment process involves injecting the wood cells with various chemical mixtures capable of destroying / killing micro-organisms and variety of insects. The injected mixture slows down decaying process and significantly prolongs lifespan of pressure treated wood to approximately 10-20 years. This lifespan doesn’t sound correct? Well… it is different from what the manufacturers put on labels (25-50 years) and varies considerably. For us, taking into the equation Chicago weather, it will probably be closer to 10-20 years. Refers to the same type of wood, pressure treated, but it’s a trade name. At all edges of every space such as floors, balconies, mezzanines, and other areas used or anticipated to be used by human occupancy more than two feet above any surface directly below. The only exception would be loading platforms installed 2’ and more above ground. At all windows or doorways that have a sill installed 24 inches or less above the floor level of a room or area. and when their level is less than two feet below the sill of such window or doorway or unless the construction of the such window or doorway serves the same purpose. At all sides of every open areaway deeper than 3’ excluding the side that opens or provides access to a stairway. “Porch guardrails” come in various flavors, depending on the porch’s design; a wall, balustrade, grill or railing at least 42” tall, area grating, or other approved device, can be treated as a guardrail. With the Chicago porch guardrails we also have one exception: For single-family and two-family dwellings, and within individual dwelling units in other Class A-2 occupancies which are primarily permanent in nature, guards whose top rail also serves as a handrail shall have a height of not less than 34 inches and not more than 38 inches, measured vertically from the leading edge of the stair tread nosing. Chicago porch building code requirement – openings in guards, balusters or ornamental patterns. This Chicago porch building code requirement applies to openings in guards, so balusters or any type of ornamental patterns. You can easily verify if your Chicago porch complies with this requirement by using a 4”, 6”, and 8” diameter spheres / balls. Six inch diameter ball cannot pass through the triangular openings that are formed by the tread, riser, and the bottom rail along the open side of a stairway. There are a few exceptions so please check the Chicago Porch Design Guidelines for details. 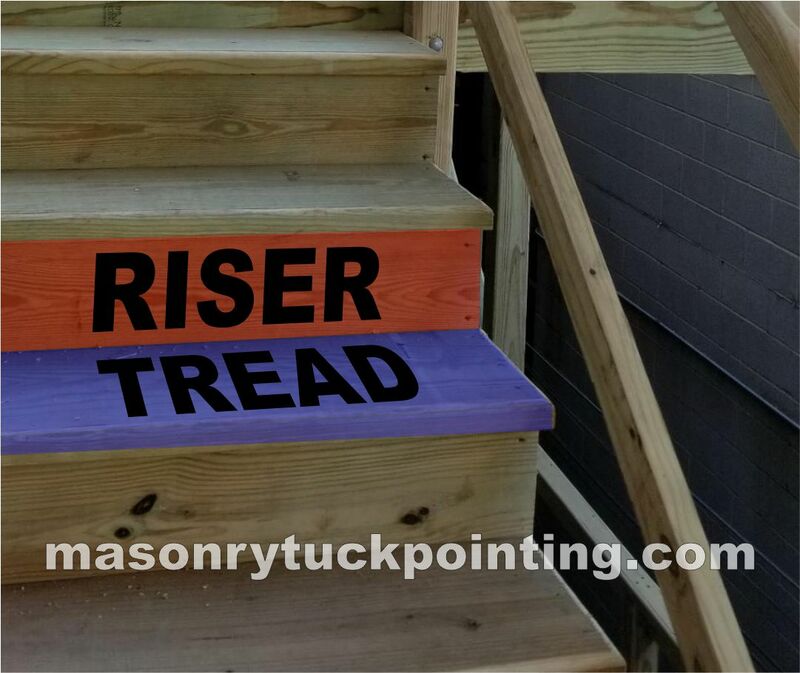 RISER is a vertical stair component made up of a board closes the space between any two treads or tread and a landing. The rise is the vertical dimension between each tread and it must be consistent between all of the treads in a flight of stairs. TREAD is a horizontal stair component that we step upon to go up or down between the levels. The rise is the vertical dimension between each tread. The consistency of width of all treads and height of all risers must not vary within any flight of stairs. Chicago porch stair risers and treads should have specific and uniform dimensions so we don’t trip when walking up or down. The maximum height of a riser should not exceed 8”. The minimum depth of a tread (without nosing) should be 9”, and at least 10” with a nosing. 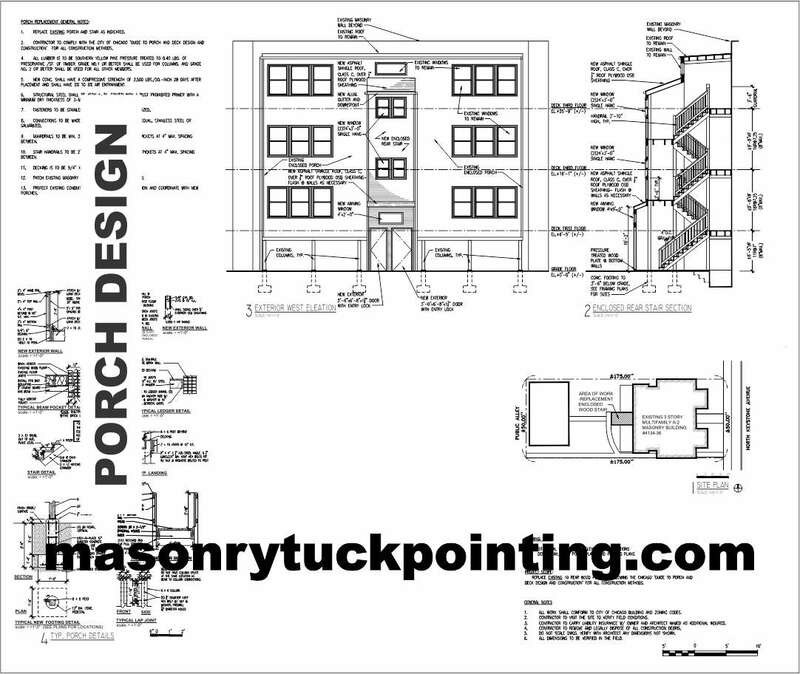 Preparation of Chicago Porch architectural drawings. Obtaining of required work permits at the City of Chicago Department of Buildings. Meetings with City of Chicago Inspectors for any interim inspections required by the city regarding the violations. Assistance in any administrative or court hearings regarding the violations. Assistance until the City of Chicago determines the violations have been closed. 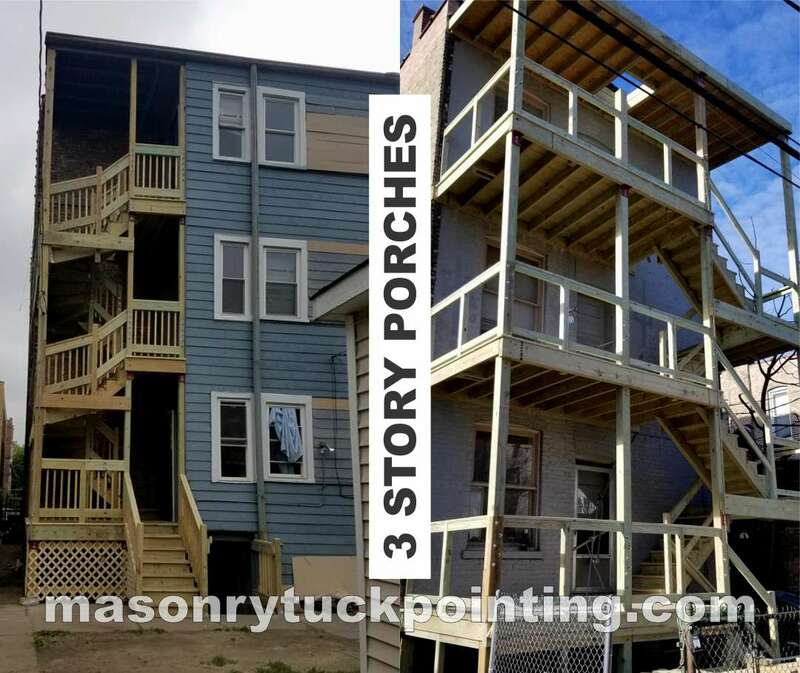 Single – Two – 3 Story porch rebuilding and repairs. 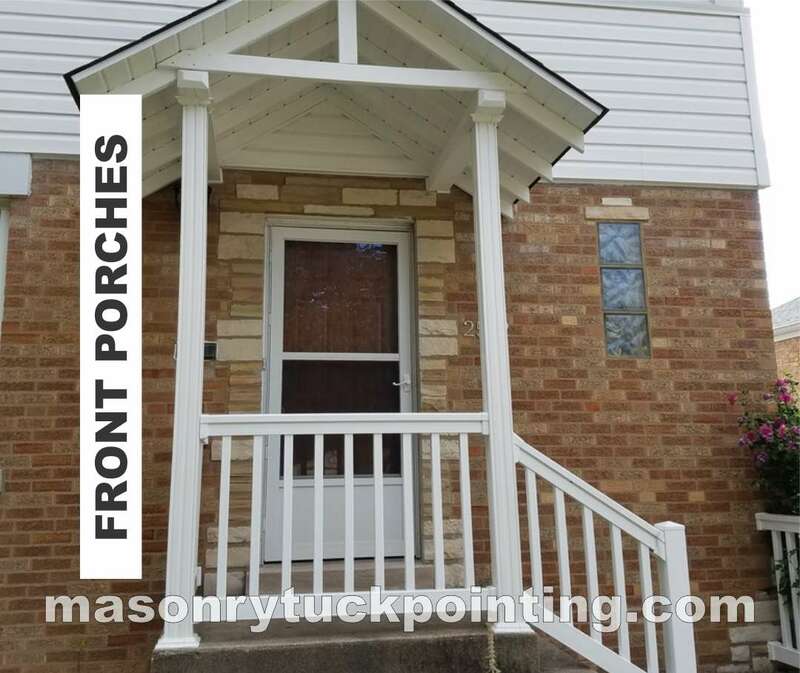 Front porches – Rear porches – Wrap-around porches. Construction of stairs and decks.